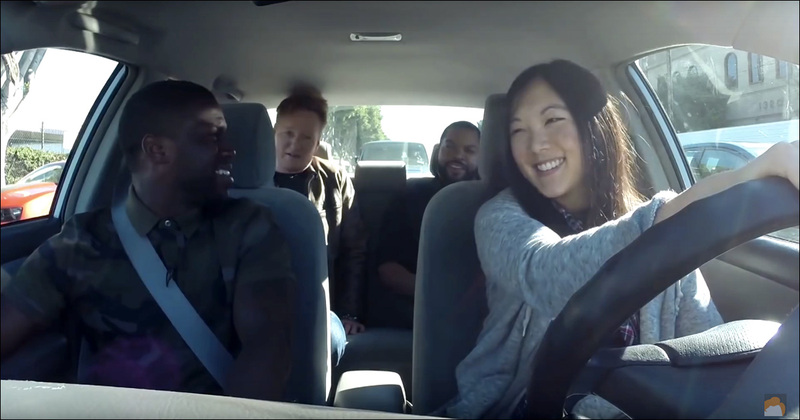 'Conan' staffer Diana Chang gets the most unhelpful driving lesson ever. Diana Chang, who works on the staff of Conan, is getting her driver's license. And because he purportedly likes to help his staff, Conan O'Brien strapped into the passenger seat to give Diana some pointers. Along the way, they hook up with some homies -- Ice Cube and Kevin Hart -- purchase a pinata and pick up some weed. As a driving lesson, it all turns out to be fairly unhelpful, but it makes for a pretty funny segment. And heeyyyyyy, check out the Rafu Shimpo cameo at around the seven-minute mark (seen outside the driver's side window). Diana and the crew were rolling through Little Tokyo. Lesson learned: Tupac wore a seat belt.